This is going to pretty tricky, as I am rubbish at noticing when books are published. 1. 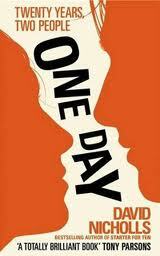 One Day by David Nicholls – I absolutely LOVED this when I read it about a year ago, and I spent forever boring friends and family with how fantastic I thought it was. I know there was an awful lot of hype surrounding this book, but I feel it is justly deserved…and no, I haven’t seen the film, and I don’t want to. 2. 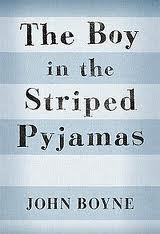 The Boy in the Striped Pajamas by John Boyne – A shockingly innocent portrayal of a truly harrowing and tragic 20th century event. This deserves its place as it would be awful if we forgot the true horrors of war. 3. 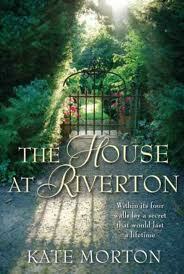 The House at Riverton by Kate Morton – I love novels and poetry written during and based on the Edwardian period and the First World War, and this amazing read captures this period in a beautiful and gripping way. I wrote a letter to Kate Morton telling her how much I enjoyed it and she replied, which is always lovely. 4. Atonement by Ian McEwan – This novel just creeps in to the past 10 years, which I am incredibly glad about. It has been a while since I read this, but it is on my summer to read list and as my memory tells me it was a fantastic read and that I enjoyed it, I feel it should be added to my list. 5. The Other Boleyn Girl by Philippa Gregory – I love Philippa Gregory’s writing; she really brings history alive and draws you in to the particulars of various Royal dynasties. This was the first of Gregory’s novels I read, so I am placing it on my list as it opened my eyes to her writing which has brought me great pleasure during the past few years. 6. The Pillars of the Earth by Ken Follett – Not something I would normally choose to read, but it came highly recommended and was a great read. 7. Harry Potter by JK Rowling – Speaks for itself! 8. The History Boys by Alan Bennett – It isn’t often that Iread plays (bar Shakespeare) but I thoroughly enjoyed The History Boys and I wish I had seen it on stage with the same cast who starred in the film. 9. The Paddington Bear Treasury by Michael Bond – This might be cheating, since Paddington Bear is an old character, but I think every house should have a copy of his stories because he is amazing and just the cutest bear. 10. Wicked by Jilly Cooper – Because I love her and that is a good enough reason for me! It is with great sadness, and much deliberation, that I have decided to impose a book buying ban on myself. I know, the horror! What could possess me to do such a thing? I think the 65 unread books on my bookcase and the 14 unread books on my Kindle very almost speak for themselves, but there is also the slight issue of finance. This is not the first time I have exerted some self control and put a ban on buying. I gave the whole shopping element up for Lent last year, just to test whether I actually had any control over these book buying urges, or if I really couldn’t help myself. As soon as Lent was over I went a little crazy in Waterstones, but that was to be expected. Now that was a mere 40 days. This book buying ban is (hopefully) going to last a tad longer, because I am aiming for a ban until my birthday…this is in October! Can I do it? Only time will tell! There is one exception (because there always needs to be a slight loophole) I am allowed to buy books for teaching and school purposes – this is obviously a big part of my life, and I don’t think it is sensible to refuse to buy books for teaching. My main reason behind this new ban comes from my eagerness to read books I have already read, and I don’t feel I will ever achieve this if I continue buying books whenever one catches my eye. I am hoping this will allow me to truly appreciate the books I actually own and to sweep the dust off those who have been sitting lifeless for too long. I seem to remember reading somewhere that a book left hidden on a bookshelf is essentially a dead object and that it is our duty as readers to bring them back to life again, and I am going to keep this metaphor in mind as I embark on this test of willpower and self control. I had planned to spend today planning lessons for next week, but I have just been out and bought a new car (still celebrating getting a teaching job) and so work has fallen to the wayside today…I can always plan tomorrow! Besides I decided my time would be much better spent finishing The Handmaid’s Tale and updating my blog. 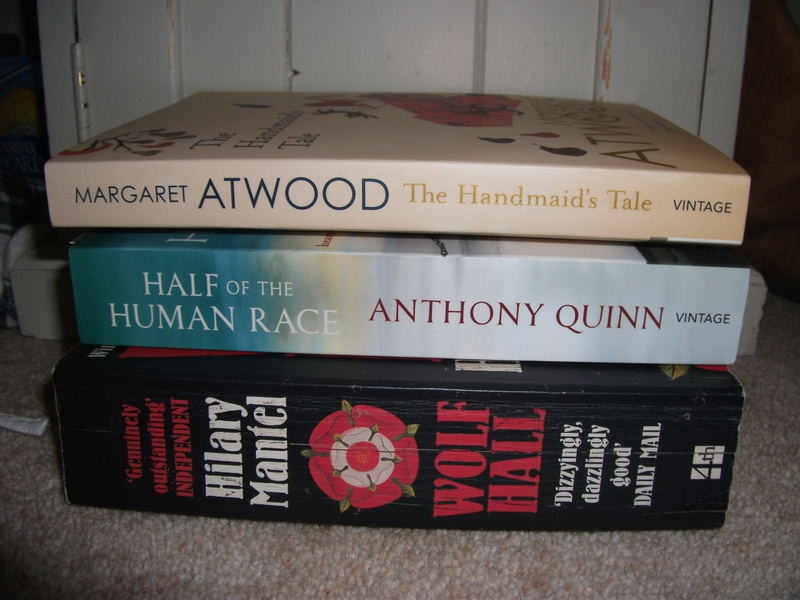 As part of my mini exploration of dystopian fiction I have already read and reviewed George Orwell’s 1984 and, having read The Handmaid’s Tale many years ago, I thought a return to it would be beneficial when it came to talking about, discussing and teaching the idea of dystopia to my Year 9s. One of my best friends is a huge Margaret Atwood fan and recommended this to me, and all I can remember from my original reading is that I found it boring, and I couldn’t quite understand why my friend was raving so much. Now I am far from being over the hill and at 24 I feel slightly hypocritical saying this, but I think age and maturity have helped me to connect with this book in a way that I couldn’t quite manage at 17. This is an attitude I feel rings true with many books I have read…and I think it is safe to say it works in both directions; there are books I read at 17 that my 24-year-old self finds no appeal in. The Handmaid’s Tale is set in The Republic of Gilead; a republic that used to be known as America. After a severe decline in population and a rise in ‘sinful’ behaviour the Government has taken drastic steps to bring order to society and to increase the population. Women have one sole purpose – to breed! Those who can’t are shipped off to the colonies or forced to work in the houses of Commanders as cooks and cleaners. Unless you are rich, and then you have the ‘luxury’ of having a handmaid, who will hopefully have a child for you. Interestingly when I asked my Year 9s to imagine and describe life in 2112, not one of them mentioned a dramatic difference in the roles of men and women. We had the usual technological developments, CCTV cameras all over the place, a few living underwater and even the idea that the Grand National would be run on sea horses, but very little on the people who would be alive and how society would work. I don’t have any feasible explanation as to why they focused on these things, but I find it slightly intriguing that they imagined a better and more exciting world, whereas the dystopian fiction we have been discussing paints a very different picture indeed. Perhaps this is just proof that they haven’t listened to a word I have said over the past four weeks! And now I move on to what to read next?!? I have had my eye on Anthony Quinn’s Half the Human Race since I worked in a bookshop well over a year ago, so that is one possibility. I could continue on my Carnegie Medal pursuit. Or I could reread Wolf Hall. I must admit the latter appeals to me the most at the moment, mainly because I just bought it this morning! I ventured to my local library to see if they had a copy, having been greatly influenced by Charlotte Reads Classics and Dove Grey Reader and their posts on the sequel Bring Up the Bodies. Alas I saw no copy on the bookshelves, so I moseyed away slightly downhearted. However on the off chance I popped in to a charity shop, and what should I find for on sale for 99p? I like to think of it as fate! I have been inspired by Jillian and Adam‘s posts, which in turn have been inspired by Broke and the Bookish and their Top Ten Tuesdays. I am also going to blog about my Classics Club List and write about the 10 books i am most looking forward to reading. 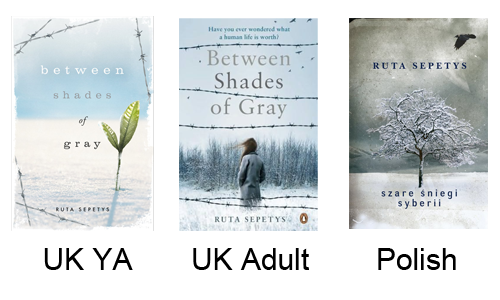 Next stop on my Carnegie Medal Award trip was Ruta Sepetys Between Shades of Gray. This was the novel I was looking forward to the most, and it didn’t disappoint. From the moment I read the opening line ‘they took me in my nightgown’, I was hooked. It follows the war-time experiences of 15-year-old Lina, her mother and her younger brother. It begins in 1941 when the family are taken in the night from their home in Lithuania by Soviet Union soldiers and are escorted across various occupied countries, living in appalling conditions and becoming increasingly more exhausted, malnourished and maltreated. I knew I would love this novel from the moment I read the blurb and admittedly there is a part of me that wonders how much this instinctive awareness of my love of a certain type of novel affects my reading and enjoyment. I’m not completely sure if that last sentence makes sense, but I know what I mean, and I think there is always a slight bias towards your own personal interests. This does not necessarily mean that I am narrow-minded in my choice of reading, or that I am not prepared to fall in love with a novel or genre I would never have considered in the past, but I do believe readers lean towards a certain type of literature. Yeah, that doesn’t make a huge amount of sense, but I am sure when I read back I will know what I am harping on about. Throughout the novel I was shocked, saddened and completely absorbed by the plight of Lina and her family, especially as it was a plight I had very little prior knowledge of. Perhaps the most scary/anxious part for me centred on the sections of the novel where the family were given an opportunity to wash/shower. For my MA I studied a unit on the Holocaust and has lectures on the Nazis methods of mass murder and the sheer horror of the communal showers, so I was prepared for the worst outcome. I was even more prepared than I should have been as when I read John Boyne’sThe Boy in the Striped PyjamasI did not expect the ending, but that is a whole different post. Each bathing/shower section was met with bated breath and a huge amount of tension…followed by relief. I am beginning to notice a common theme in the Carnegie Medal Award books I have read so far – a preoccupation with harrowing and upsetting subjects and issues. I don’t know if I am happy with the seriousness of all the novels I have read so far, yes it is important that these type of issues are discussed and explored in children’s literature, but I think some light relief is needed as well. Arguably some of the novels have humourous sections, but I still think these have been overshadowed by the more serious themes and I am not sure if, as a reader, I am completely happy with this, but that is just a personal preference. 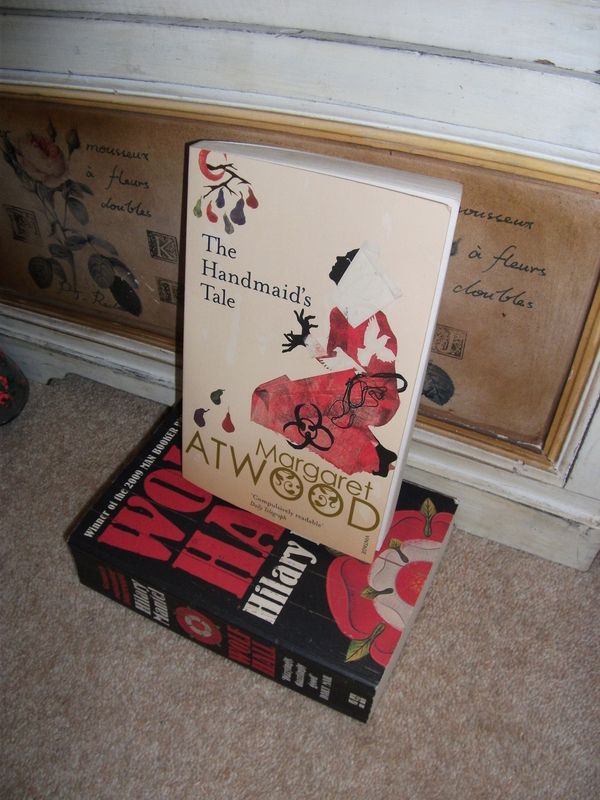 On that note, I think I am going to take a mini break from the Carnegie shortlist and read something a bit different…choosing the next read is always a huge and difficult decision for any reader, however I think I am going to reread Margaret Atwood’s The Handmaid’s Tale. Not quite suitable to counter balance my little moan about serious and depressing literature, but I need to read it to help my year 9 teaching. Besides I am quite interested to see how I feel after a reread as I seem to remember I wasn’t a huge fan when I originally read it many moons ago. Continuing on my Carnegie Medal Award journey, I picked up Ali Lewis’ Everybody Jam. As is evident from earlier posts on the shortlisted books, I am enjoying shadowing the awards and developing my knowledge of YA literature. The great thing about being part of a school book group is hearing about the pupils’ experience of reading these books and their personal opinions and recommendations. Bearing this in mind, I had high hopes for Everybody Jam as pupils and teachers alike were raving about it. Unfortunately I was left somewhat disappointed. Everybody Jam is told from the perspective of 13-year-old Danny, who lives on a cattle farm in the Australian outback with his family. They are a family facing many difficulties, from the death of a child to teenage pregnancy to drought and hire a ‘Pommie’ housegirl to help them get things back on track. To begin with I enjoyed the novel, probably because I wanted to know what had happened to Danny’s older brother, but once this mystery was solved I felt it was a bit of a chore to finish the book. I enjoyed the Australian lingo, but or me personally the constant reference to Liz as a ‘Pommie’ was annoying…I have worked in an Australian bar, know Australians and have even dated one, and yes they do refer to the English as ‘Pommies’ but I do not feel it is vital to mention it every single time the character appears; for me it makes her slightly unrealistic and just winds me up. The narrative and the plot were just too slow and dragged for me. ; I was wishing the end would hurry up and counting down the pages, something I haven’t done with the other books I have read for this award so far. I also found Danny irritating, and for a protagonist this is not a good sign. I don’t mind if I can’t relate to the protagonist or if they are ridiculously self obsessed or anything like that, I just need to feel some sort of emotion other than irritation. But perhaps I am being unfair. I have had a hugely crazy week, what with teaching and a (successful) job interview yay, so I have probably been half here and half on another planet worrying about various things. In Lewis’ defence it is clear that she has written a hugely popular book, as all the pupils shadowing the awards have been singing its praises, it just hit the same chord with me. This just further reinforces the subjective nature of reading and the beauty of it; not everyone enjoys the same thing and that is what makes it amazing in my eyes. Next step Between Shades of Grey. Once again I have heard lots of amazing things about this book (lots of pupils have been telling me how good it is when they see me carrying it) and I am praying this one doesn’t disappoint….I am sure it won’t!